Check this page for Saxon Lodge special offers and activity packages. 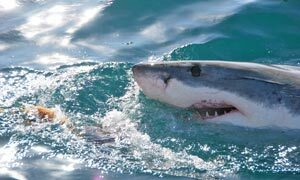 Experience this once in a life time event in the Great White Shark Capital of the World. This special rate includes bed & breakfast at Saxon Lodge and your shark dive in Kleinbaai. Rates are subject to availability and terms and conditions. Walk - and call - in guests after 14H00 on the day will be eligible for the "bums in beds" rate.